Enclosed farmland characterises the landscape of this part of Buckinghamshire. 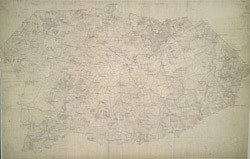 To the right of the manuscript, a section of the Grand Junction Canal is depicted running from Leighton Buzzard to Fenny Strafford along the River Fosse Valley. Two Roman roads are depicted on the plan: the Watling Street from London to Wroxeter in Wales via St. Albans and Leicester, at top right, and the Akeman Street Way, at lower left.